Does Pickle Juice Kill Stomach Bacteria? Pickle juice is sometimes touted as an effective home remedy for getting rid of stomach bacteria or soothing an upset stomach. While it might be a cost-effective home remedy, there's little evidence that pickle juice can fight bacteria in the stomach, as the main ingredients in pickle juice don't have the ability to kill bacteria any more effectively than natural stomach acids. 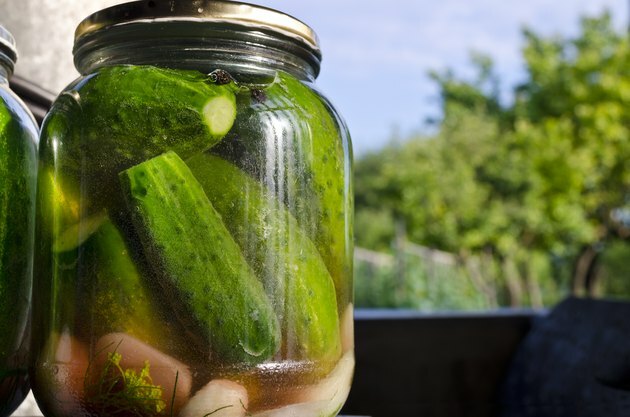 Vinegar is the main ingredient in pickle juice, as it is used in the fermentation process. While vinegar is known to have some antimicrobial properties, it is mostly beneficial in killing bacteria in food preparation, according to a 2006 study conducted by Dr. Carol S. Johnston and Cindy A. Gaas at Arizona State University. While acetic acid, the main bacteria-killing component of vinegar may inhibit the growth of Escherichia coli, group D Enterococcus and, to a lesser extent, Staphylococcus aureus and Pseudomonas aeruginosa, there is little medical evidence to show that it will help kill bacteria already in the stomach when ingested orally. Salt is another main ingredient in pickle juice, and it has been used to cure and preserve foods around the world for centuries. However, there is little scientific proof that salt can kill bacteria in the stomach, especially at a healthy dose. Increased, prolonged salt intake is also associated with increased risk of stroke and cardiovascular disease according to a study conducted by Dr. P. Strazullo et al. at the Department of Clinical and Experimental Medicine at Federico II University of Naples Medical School and published in "BMJ" in 2009. Potassium is found in pickle juice, and while it may have some health benefits including reducing cramping, assisting in metabolic processes and regulating fluid levels in the human body, there is no scientific evidence that it can affect stomach bacteria. Potassium deficiency also will not cause an increase in stomach bacteria, though it can result in fatigue, abnormal heartbeat and severe headaches. Pickle juice is not particularly high in vitamin C, but it is one of the main ingredients. Vitamin C is an important part of a healthy diet and a lack of vitamin C can cause anemia, inability to fight infection, weight gain through slowed metabolism and gingivitis according to MedlinePlus. However, there is no medical evidence that vitamin C kills stomach bacteria. What Can Sodium Do to Your Stomach If You Have Too Much? Are There Any Vitamins That Will Help With Bloating and Gas?